Contributed by Audrey Fisk of the Foresters Heritage Trust. 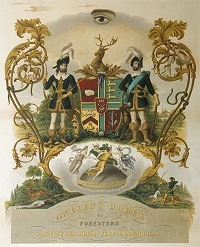 In 1813 a society in Yorkshire, called the Royal Foresters, began to open branches that together formed an affiliated friendly society for mutual financial support. 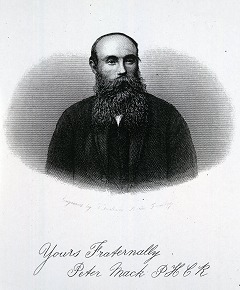 Eventually, the Ancient Order of Foresters became one of the two largest affiliated societies in the United Kingdom. The Ancient Order was formed, almost readymade, by seceding from the Royal Foresters in 1834. This was a period characterised by widespread demands for universal (male) parliamentary democracy. The 1834 secession itself was a result of a drive for democratic decisions on the general rules governing the Royal Foresters. However, the Ancient Order did not appear in the Lothians until 1865 when Court 'Lamp of Lothian' was opened at Haddington. By then, much had changed. The popular clamour for universal franchise had quietened after the suppression of the Chartists in 1848, and on the economic front, industrialisation was in full swing in Scotland as in England. The Foresters by that time had accumulated years of experience of running Courts (branches); actuarial science had progressed; and moves were now in place to further government regulation of all friendly societies to prevent insolvency. These moves led to the important Friendly Societies Act of 1875. This Act laid down systems of management and reporting, and five-yearly valuations of assets against liabilities. This was the background to the spread of the Foresters through the canny Lothians. In 1868, Peter Mack, a joiner by trade and a member of Court 'Lamp of Lothian' in Haddington, moved to Edinburgh and pioneered the opening of the city's first Court, 'Heart of Midlothian', which quickly became the second largest in the whole Order. 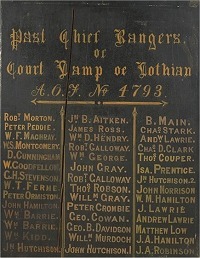 By 1876, 48 Courts had been opened in the Lothians and Edinburgh had been voted as the venue of the Executive Council of the Order for the year, the councillors all being local men, with Peter Mack as High Chief Ranger. In practice, the Courts were run by a committee of officers elected by the membership, although all members present at meetings had the right to vote on any matter put before them. Technically, both secretary and treasurer, themselves elected, were the servants of the Court but clearly they had considerable influence. In a sample year (1881), the occupations of 42 secretaries and treasurers have been identified. These fall overwhelmingly into the official Census categories of 'Industrial Class'. Two fell into the professional class and four into the commercial class (as clerks). Of the remaining 36 men, three were printers or booksellers, six were providers of food and clothing, eleven were workers on housing and furniture, and sixteen were involved in paper, glass, coach, boiler, carpet and cement making, tanning, mining, railways, docks and blacksmithing. Clearly, Foresters' Courts were run by working men for working men in the Lothians. 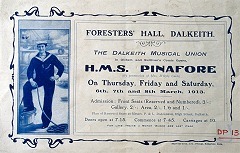 Membership continued to be high, providing security for many thousands of families, until the First World War and the following Depression took its toll of membership. In Scotland all Court meeting places were public halls, reading or schoolrooms, unlike England where many Courts still met in public houses. Reports to the Order's journal, the Foresters' Miscellany, include many social and benevolent activities, parades and parties for juvenile Foresters. The introduction of the Welfare State in 1948 led to the closure of many Courts. Some, however, continued and witnessed many changes, including the modernisation of the Order at the end of the 20th century, which culminated in centralisation and incorporation in September 2002. Courts, however, still continue their social and benevolent role.